It’s that time of year: teachers are loading on papers to get done by Thanksgiving, deadlines are approaching fast as we tackle this crazy two weeks before it’s finally time to go home and visit our families, and take several well-deserved naps. In times like this, it’s really easy to get stressed out and want to explode from all the stress of papers you haven’t written and research you haven’t done. This past weekend, instead of getting all my work done, I did something that I haven’t in a really long time. I took time out of my schedule to just breathe. To just be. I was super lucky to be able to go up to Pyramid Lake this weekend with a lot of my friends from Music Ministry who sing at the 6:30 Mass on Sunday Nights at Saint Vincent’s for a retreat led by Sister Sean and Father Chris. A lot of the retreat was also put together by Joan Horgan, who unfortunately couldn’t come with us. During the weekend at Pyramid Lake, I had absolutely no phone service. I didn’t do any homework. I ripped my favorite pair of jeans. It was the most wonderful weekend I’ve had in a really long time. Pyramid Lake is in short absolutely breath taking. You’re surrounded by trees and nature. The air there smells sweeter and you feel so alive. 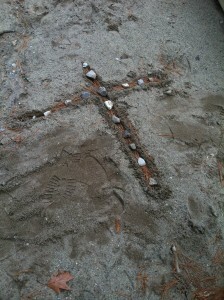 A cross my friend drew in the sand, and added some beautiful rocks! Eagle Lake. It was so serene here. 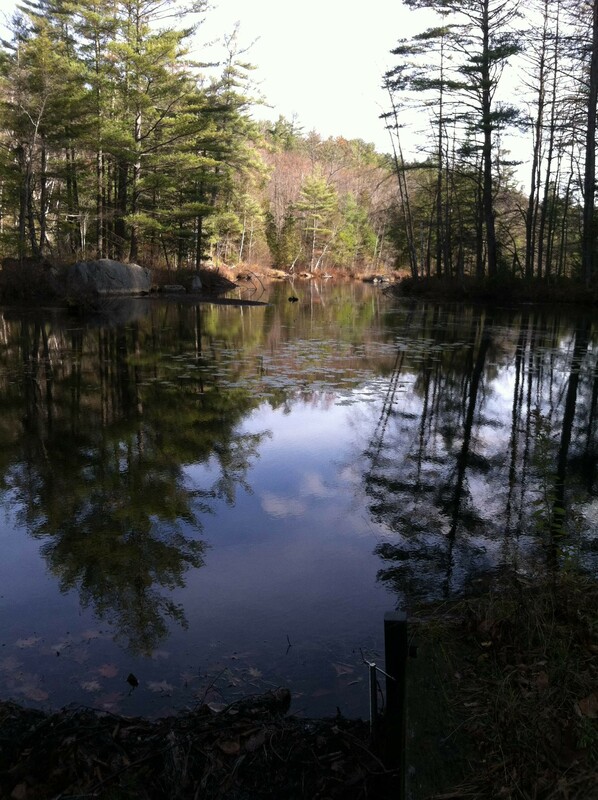 Our hike with Father Chris led to this spot. The theme for our retreat was Fill My Cup. We talked a lot about gratitude, and about how God always gives us what we need. Sister Sean lead guided discussions about these topics and we always had a great conversation. Retreats are such a unique environment because they challenge you to think more deeply than other facets of life. You’re not analyzing for a grade, you’re thinking about something to benefit your soul. At first, I was really apprehensive about going. I had a lot of work that I was leaving behind at school, and I was already behind in those things. Going on the retreat would put me even further behind schedule and I wasn’t sure if I could catch up. 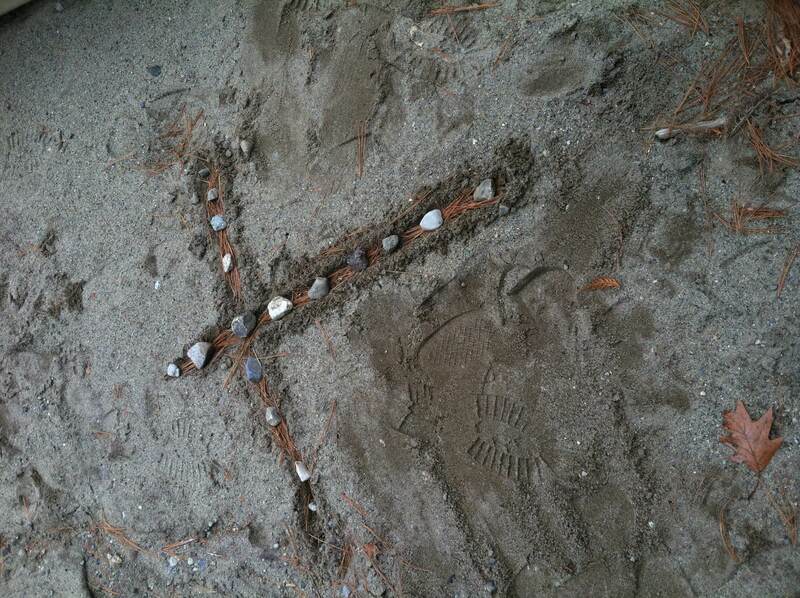 Someone even said on the retreat, it’s in times like these when you really shouldn’t go, that you really need to. Stepping away from everything this weekend was exactly what I needed. I’ve felt so zen since I’ve returned, and I’m now focusing on getting everything done for my deadlines. In all of the chaos, we need to find time to breathe. PS- If you can help it, don’t procrastinate writing that ten page paper. Trust me. PPS- Check out fellow blogger Zak’s post about Pyramid Lake as well! !